So so so many people tell me they have a cookbook to write, asking for advice, and I almost always do my best to discourage them, with Asian delicacy and Germanic firmness, I hope. Because I believe that there are too many cookbooks out there already and the ones so often published add nothing new. So when writer and educator Dianne Jacob asked me what does define a successful cookbook, it got me thinking. She’s written an excellent post collating many, many responses from people in the industry. The responses are surprising in their diversity. The first and obvious answer is, a book is successful if it makes money for the publisher and author. And there are many ways this can happen, meaning that a book that sells 10,000 copies can be a resounding success while a book that sells 30,000 copies can be called a flop. Thomas Keller’s books, notably Ad Hoc At Home, sell in the hundreds of thousands and are a success simply by that fact: the sheer numbers make them enormously influential regardless of the cash they earn. That means more than money to Keller, the impact they’ve made. These books are very expensive to produce. The current one, The Bouchon Bakery Cookbook, due out next fall, has involved three chefs, one writer, two recipe writer-developer-testers, a photographer (and countless ancillary chefs in addition to the main ones). It involved chefs on either coast and a writer in the middle, requiring lots of travel and accommodations. Photography is very expensive. Printing is very expensive. Shipping and warehousing these large 3 to 4 pound objects are expensive. So they have to sell a lot to make money. Meaning they continue to earn money long after the publisher and author stopped working on them. Chronicle’s first printing of Ruhlman’s Twenty was 25,000. It sold out in months, so quickly that Bill wasn’t able to hit the reprint button fast enough and so Amazon has been out of stock for months (the second printing arrives this week, yay!). So by Chronicles standards, it’s successful. But as far as I’m concerned, what makes it successful is the fact that it encourages people to cook. That’s my main goal. If I can inspire more people to cook, the book is a success. If it furthers and spreads valuable cooking information it’s successful. If it adds something new to the world and of food and cooking, then it is successful. Those are my definitions of success. They are not regardless of financial success—to me financial success is an indication that people are buying it and spreading the information, and it gives the publisher the confidence to keep investing in me. But a book that makes a lot of money but neither adds something new nor encourages people to cook is not a success. In my book. I really like that she cares about how the author feels about it in the end. That’s a good editor/publisher. I asked her two other questions: When a proposal lands on your desk, what are you most hopeful of finding? “A unique voice that speaks to me,” she wrote, “and/or to an audience I can identify (whether it’s working parents, vegetarians, foodies, watchers of food tv, etc.). In other words, she can envision a market for the book. It is, of course, business. She’s not going to keep her job if people don’t buy the book, no matter how happy the author is. Lastly, and you out there who hope to write a cookbook take heed, I asked her what is the most common reason for turning down a proposal? I still had to wonder: a vegetarian cookbook by an Israeli-born chef Yotam Ottolenghi who owns high-end delis in London. An incredible seller here? Why? The other photographed here is Charcuterie. This is a success that I am perhaps most proud of. Brian and I were paid a very small advance for what amounted to two years work ($50,000, split in half, less 15% for the agent, less, oh, at least 15% for taxes. So that’s netting $18,000 spread over two years; authors only get half up front, a quarter on delivery, a quarter on publication, typically). We wrote it because we loved the subject, no other reason. It’s success is almost bizarre. It is a book reliant on the two main ingredients that throws fear into most American’s hearts: animal fat and salt. The recipes don’t take 30 minutes, but rather days and even months. If you do them wrong, some of them can kill you. The book has sold more than 100,000 copies, and its bacon recipes has, according to readers and twitter, changed lives. That, to me, is a success more gratifying than any six-figure advance. 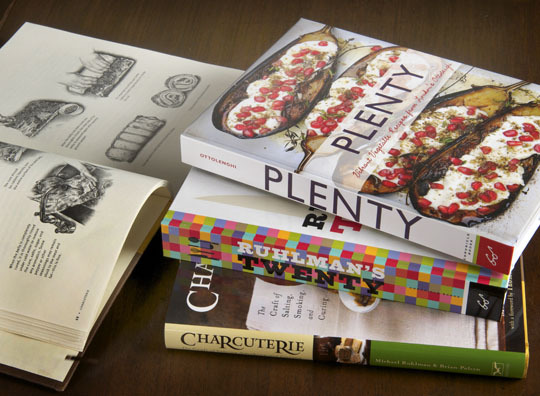 So tell me, what to you makes a cookbook successful? Seriously, I really want to know, because I might want to write more and don’t want to disappoint! My post on the Bouchon Bakery Cookbook and the Salumi Update. Homesick Texan’s recipe for making a cookbook. The New Yorker is always filled with interesting stories on many different topics. If you have not seen this please see social media explained with doughnuts. I’m not sure where you’re getting your info, however good topic. I needs to spend a while finding out more or understanding more. Thank you for wonderful info I used to be looking for this info for my mission. Hi! I just wanted to ask if you ever have any problems with hackers? My last blog (wordpress) was hacked and I ended up losing a few months of hard work due to no data backup. Do you have any methods to prevent hackers? You have brought up a very fantastic details , thankyou for the post. “For visions come not to polluted eyes.” by Mary Howitt. I like this blog its a master peace ! Glad I detected this on google. “Tears are the rinse water of an unhappy heart.” by Raynor Schein. Really superb info are available on web site. Hey there, You’ve done a terrific job. I will surely digg the idea and during my view suggest to our friends. I am sure they’ll be benefited out of this website. Thanks for all your efforts that you have put in this. very interesting information. “The worth of a book is to be measured by what you can carry away from it.” by James Bryce. This is a really sweet webisite that I found online. I do believe all of the ideas you have presented to your post. They’re really convincing and can definitely work. Nonetheless, the posts are too short for starters. Could you please lengthen them a little from subsequent time? Thank you for the post. I like your wp style, where would you get hold of it via? I’m still learning from you, while I’m improving myself. I definitely liked reading everything that is written on your site.Keep the posts coming. I enjoyed it! We absolutely love your blog and find most of your post’s to be exactly I’m looking for. Do you offer guest writers to write content to suit your needs? I wouldn’t mind composing a post or elaborating on some of the subjects you write with regards to here. Again, awesome site!